Got a youngster who'd love to drive? 'Young Driver' is for you. Jonathan Crouch and daughters try it. Remember when you first learnt to drive? It probably seems a long time ago but perhaps you can just recall the feeling of excitement and anticipation that accompanied the first time you got behind the wheel. 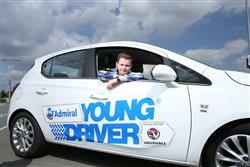 If you've children aged between 10 and 17, a session on the Young Driver programme will bring it all flooding back. The concept behind 'Young Driver' is pretty straight forward - that of giving older youngsters a chance to drive in a safe, controlled environment. And learn all the basics so when the time comes for proper driving lessons, they've got a head start. There's probably a Young Driver day being organised at a local car park or shopping centre somewhere near you - there are venues all round the UK. You can find a list of vehicles and dates on www.youngdriver.com. Vauxhall's sponsorship of the programme makes a lot of sense as surveys often show that the first car people ever drive is also the first one they end up choosing to buy. When it comes to Young Driver, the model in question is Vauxhall's Corsa supermini which has long been a favoured choice by driving schools around the country. This car's great all-round visibility, easy steering and a light clutch are all attributes that help in this kind of tuition. Recent research by Vauxhall that looked at the driving habits of 1,000 children and their parents, shows the real need for programmes of this sort. Their survey found that around two fifths (41 per cent) of parents are terrified at the thought of their kids driving them around when they're learning, with nearly half (42 per cent) of parents admitting to forgetting the highway code themselves. For parents who bravely take the role as driving instructor, nearly one in five trips resulted in a dented car, along with a quarter admitting to having snapped when sitting in the instructor's seat. What's more, despite over half of kids (53 per cent) thinking dad is a better driver than mum, 20 per cent of driving lessons with dad resulted in a crash, according to the survey responents - compared to only 8 per cent for mums. "You need a very patient, friendly instructor for this kind of thing and 'Young Driver', it seems, has plenty of them.."
So how does the Young Driver programme work? With two daughters who fall into the required age group, Amy 12 and Ellie 16, I thought I'd go and find out. It was a particularly good test as both are at different stages in the initial driving learning process, Ellie having done quite a lot at low speeds on private land. Amy though had done virtually nothing. I found a Young Driver day taking place locally to us in Horsham, Sussex and booked an hour for each of the girls. Prices start from £36.45 per half hour. Each girl at registration was given their own driving diary in which, they were told, they would be able to record their progress. You need a very patient, friendly instructor for this kind of thing and 'Young Driver', it seems, has plenty of them. I sat in with Tony to start with, who was looking after Amy and introducing her to quite a few of the basics. She mastered the starting procedure quickly enough, but needed some help with steering and special awareness. Ellie, being slightly more advanced, was able to move on to intricacies like coned slaloms and three point turns. At the end of the hour, both girls had progressed a huge amount, not only in technique but also in confidence - to an extent that would have taken me weeks of nail-biting Sunday afternoon excursions to the local supermarket car park. Try it with your own children and you'll probably be left with the same feeling I had at the end of it all. Just this: wish they'd had this when I was that age.